Montgomery County, Indiana has a rich, colorful history of newspapers, both in their coverage and the personalities that ran them. In this post, we will share some highlights of this heritage and emphasize some of the papers that are available in Hoosier State Chronicles (HSC). Crawfordsville Record, February 8, 1834. Hoosier State Chronicles. The earliest paper from Montgomery County in HSC is the Crawfordsville Record. Editor Isaac F. Wade and printer Charles S. Bryant published its first issue on October 18, 1831. As Herman Fred Shermer noted in an article about Montgomery County publishing, the “type and presses for the Record plant were brought by freight wagons from Cincinnati, Ohio” and the cost of the publishing the first issue was approximately $400. 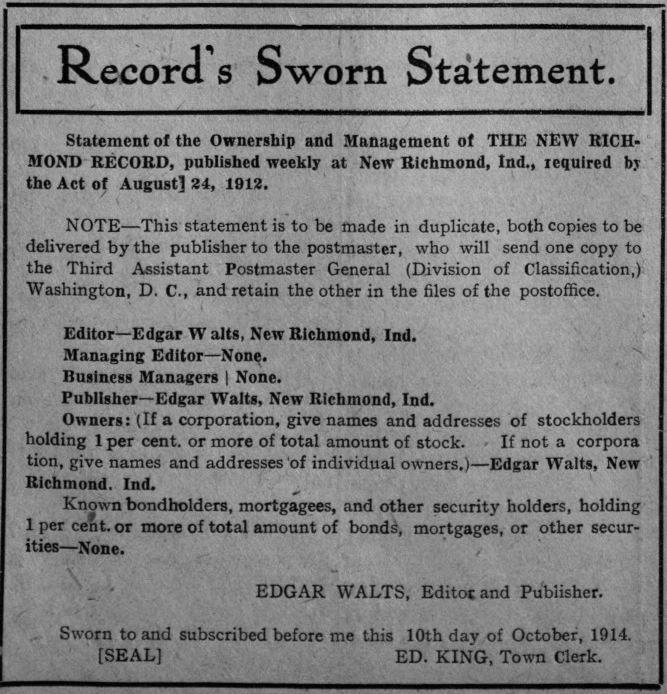 While Wade and Bryant intended for the Record’s first issue to arrive in September, they were delayed a month because the printer required a capital “D” for typesetting. Wade, as a good Whig, believed that having that capital “D” was essential, as the paper would regularly refer to “Democrats and the Devil.” The paper ran until 1838, after the death of subsequent publisher William Harrison Holmes. A brief revival of the paper in 1839-40, led by William H. Webb and Henry S. Lane, never regained the paper’s subscription base and it ceased altogether. 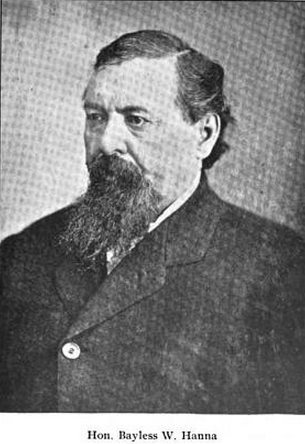 Henry S. Lane. NARA/Wiki Commons. Speaking of Henry S. Lane, he also co-founded one of Crawfordsville’s premier Whig newspapers during the 1840s, the People’s Press. Lane, along with a consortium of political and business leaders, established the People’s Press to be the official Whig party newspaper for Montgomery County. They recruited Pennsylvanian William H. Bausman as its editor. It ran from 1844 until 1848, when its “apparent financial success” waned due to “bad editorial management.” It then ran for a short, six-week stint as the Tomahawk until the paper was bought out by publishers Thomas Walker Fry and Jeremiah Keeney. Crawfordsville Journal, September 14, 1865. Hoosier State Chronicles. Out of the ashes of the People’s Press and Tomahawk, Fry and Keeney founded one of Montgomery County’s standard papers, one that still continues today (albeit in a different form). 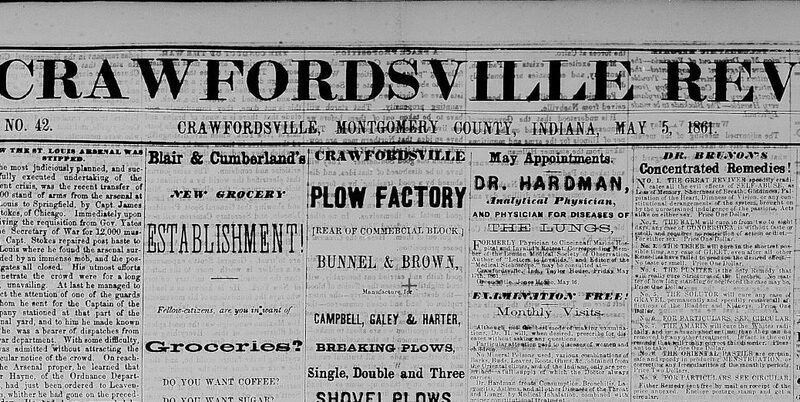 The Crawfordsville Journal started publication on July 27, 1848. Originally a Whig paper, the Journal embraced the newly-formed Republican Party in the mid-1850s. The Crawfordsville Review, founded in 1841 and purchased by Charles H. Bowen and Benjamin F. Stover in 1854, served as the Democratic foil to Journal’s Whig perspective. 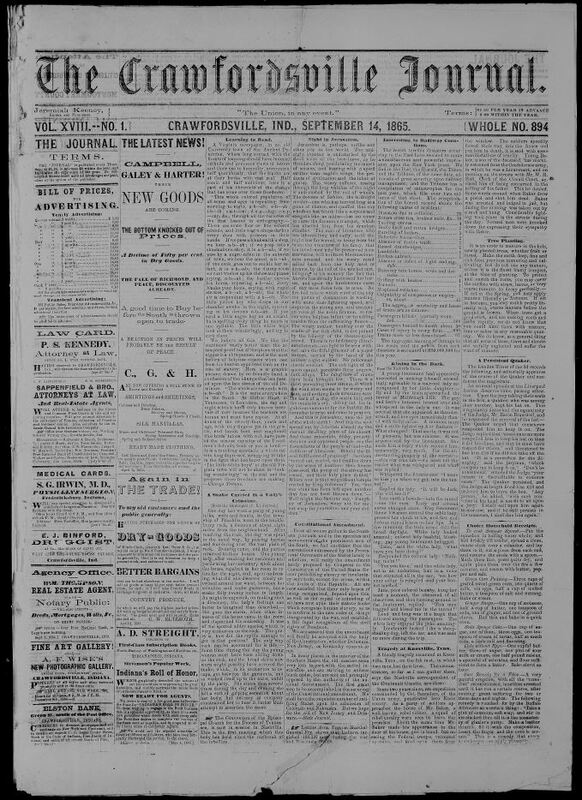 Crawfordsville Review, September 16, 1865. Hoosier State Chronicles. The Journal’s Jeremiah Keeney and the Review’s Charles H. Bowen (Stover sold out to Bowen six months after their acquisition) maintained a years-long feud in their respective papers. As a recent article in the Crawfordsville Journal-Review noted, Keeney and Bowen exchanged pointed barbs at each other in the press. Here’s a few additional examples we found in Hoosier State Chronicles. In the June 7, 1855 issue of the Journal, Keeney wrote an editorial called “Clean Streets,” where he commended the public workers who swept the streets but then derided Bowen’s supposed quibble with cleanup. 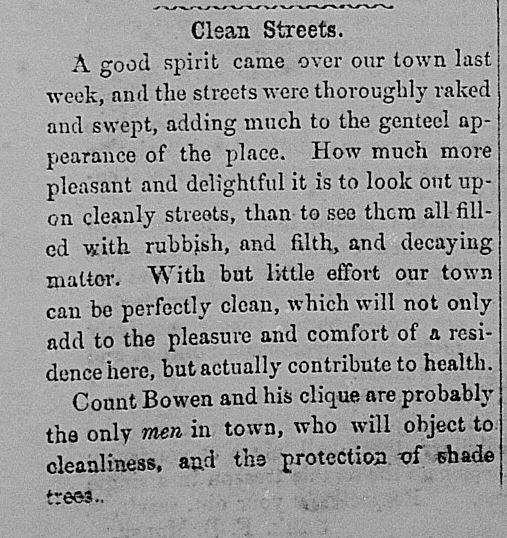 “Count Bowen and his clique are probably the only men in town, who will object to cleanliness, and the protection of shade trees,” Keeney declared. Keeney preferred name for the Review’s editor was “Count Bowen,” likely a jab at his purported leadership status in the town. Crawfordsville Journal, June 7, 1855. Hoosier State Chronicles. [P]ay no attention to the filthy slang of this poor miserable creature, half idiotic and totally irresponsible, he should be passed by with total indifference and regarded only as a canker, a plague-sore, an embossed carbuncle upon the body of a corrupt and depraved humanity which purity should shun as a pestilence. Bowen certainly elucidated his point, in the most elaborate way possible. Imagine if these two men were alive today, trading jabs on Twitter or in Facebook comments. Some things don’t change, after all. Crawfordsville Review, October 7, 1865. Hoosier State Chronicles. Bayless Hanna was seen to-day walking down Main street with his music box, following a one-armed soldier who had a hand-organ in a little boy’s express wagon. The soldier would occasionally stop in front of a business house and play a tune, while Bayless and Rodgers would stare with mouth wide open, at the wonderful machine. He operated the Review for two years before President Grover Cleveland appointed him Minister to Iran and then Minister to Argentina, a position he held until his death in 1889. He died in 1891, in Crawfordsville. Bayless W. Hanna. Find A Grave. At a time when women were often delegated to domestic pursuits, Mary Hannah Krout completely bucked the trend. Born in Crawfordsville in 1851, Krout descended from a long-line of accomplished scholars. Specifically, her grandfather served as the state geologist and taught natural science at Butler University. However, her intellectual passion was writing, particularly poetry. She was a published poet in local newspapers as early as 10 years old and gave lectures in her teenage years. This culminated in her decades-long work in newspaper journalism, with positions at the Terre Haute Weekly Express, the Crawfordsville Journal, and the Chicago Inter-Ocean, where she covered the Hawaiian revolution of 1893. Alongside her newspaper work, she authored eight books and helped Susan Wallace finish Lew Wallace’s Autobiography. 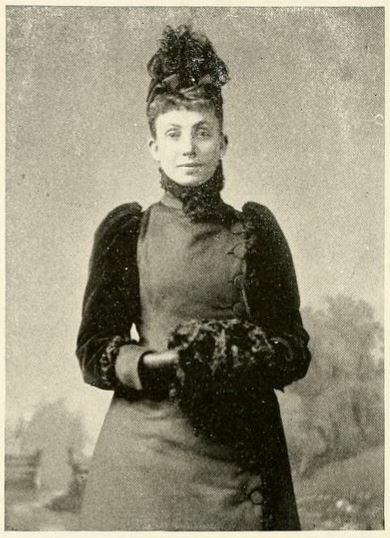 Mary Hannah Krout. Internet Archive. Lew Wallace, who has been rusticating in our city for several weeks past, left suddenly for New York a few days since. Rumor has it that he is about to join a filibustering expedition against Mexico. Should he be so unlucky as to suffer capture by the French mercenaries of Maximillian, we trust he may be granted a fair trial before a drum-head court martial. We should regret very much to hear of his being arraigned before a civil tribunal. Much like with Keeney and Bowen’s feud, the Review‘s strongly-worded opprobrium against Wallace emanated from intense political partisanship. 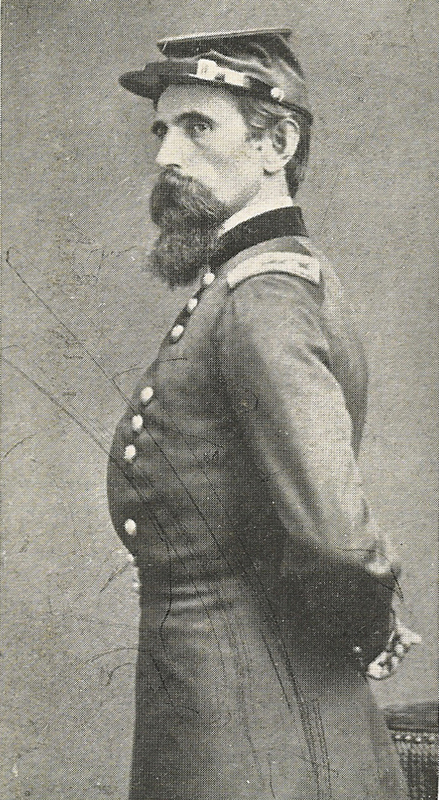 Lew Wallace, in full dress uniform. General Lew Wallace Study & Museum. Another Crawfordsville paper, Thomas C. Pursel and Robert B. Wilson’s Evening Argus, first rolled off the press in 1882. “Argus” as a term seems relatively antiquarian to our ears; nevertheless, its etymology is fantastic. Originally a name for the “giant with 100 eyes” from classical mythology, it eventually meant “watchful guardian.” It seems safe to assume that the latter definition applies more as a name for a newspaper than the former. The daily newspaper had a brief three year run under the solo title of the Argus. In 1885, Walter E. Rosebro and Samuel M. Coffman purchased it and merged it with their paper, the News, to make the Argus-News. It continued to appear in weekly and daily formats until 1900, when Coffman purchased the Review. He dropped Argus from the name and re-branded the paper as the News-Review, which ran for eight years before abbreviating the title to the Review. Coffman later embarked on another newspaper venture, the Crawfordsville Daily Progressive, but it languished and he filed for bankruptcy in 1917. New Richmond Record, October 15 1914. Hoosier State Chronicles. It is a six-column, six-page paper, run on a gasoline propelled power press. It is independent in politics, and makes a specialty of as much local news as is possible to furnish its readers with. It circulates in Montgomery, Tippecanoe and adjoining counties. It meets the requirements of the town and with it is connected a good job department. 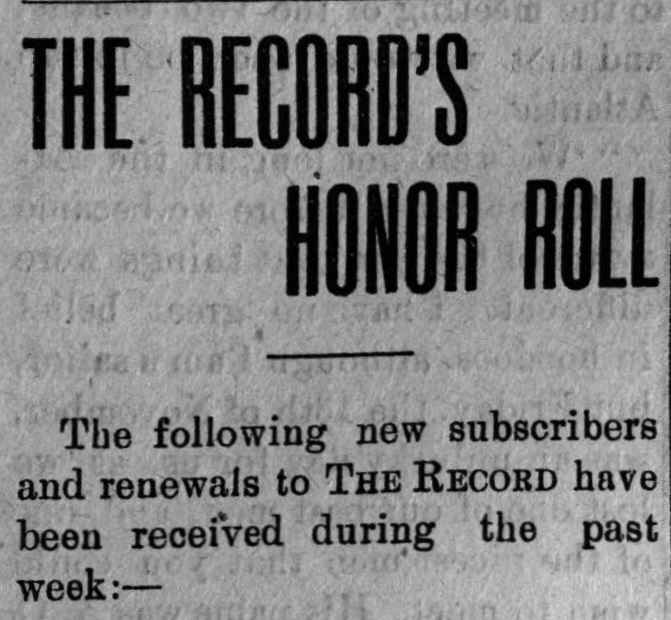 During its run, the Record often praised its subscribers for continuing to patronize the paper, in a segment called the “Record’s Honor Roll.” The “honor roll” listed all the “new subscribers and renewals to THE RECORD during the past week” from Montgomery County, Indiana, and across the country. His “honor roll” likely helped circulation; by 1920, the Record had a circulation of 500 (for a town whose population was 496, but whose readership likely extended into rural Coal Creek Township and the rest of the county). New Richmond Record, January 7, 1915. Hoosier State Chronicles. Today, readers in Montgomery County patronize two major newspapers. The Crawfordsville Journal-Review, founded in 1929 with the merger of two flagship county papers, publishes a Tuesday-Saturday print version and an online version. The Paper of Montgomery County, established by Journal-Review veteran reporter Gaildene Hamilton in 2004, also delivers a daily print version and online version. 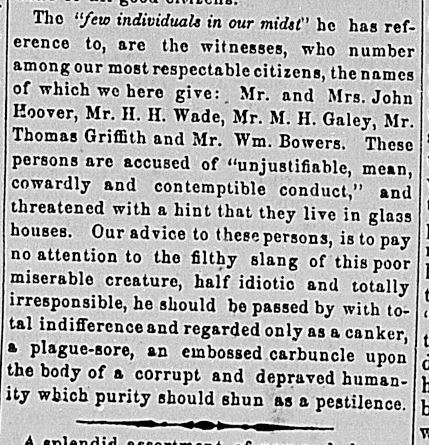 In all, Montgomery County’s newspapers often displayed the rough-and-tumble political winds of the nineteenth century, an era whose partisanship and vitriol mirrors our own. It wasn’t, however, the only part of their story. Montgomery County also facilitated forward-thinking pioneers like Mary Hannah Krout, Samuel Coffman, and Edgar Walts. Like much of history, Montgomery County’s heritage of newspapers exemplifies a nuanced, intriguing legacy. 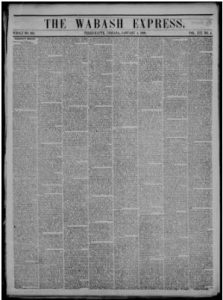 Wabash Express (weekly edition) available at Chronicling America, Library of Congress. 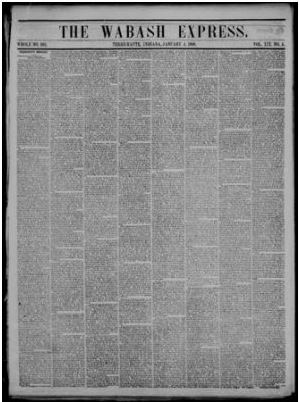 On December 13, 1841, John Dowling established a Whig weekly titled the Wabash Express in Terre Haute, Indiana, located on the banks of the Wabash River. John’s brother, Thomas Dowling, had previously owned the Wabash Courier, and one of the terms of sale prohibited Thomas from establishing another Terre Haute newspaper for five years. Thomas recruited his brother to establish the Express in his stead to circumvent the provision. John Dowling sold the Wabash Express in 1845 to David S. Danaldson. 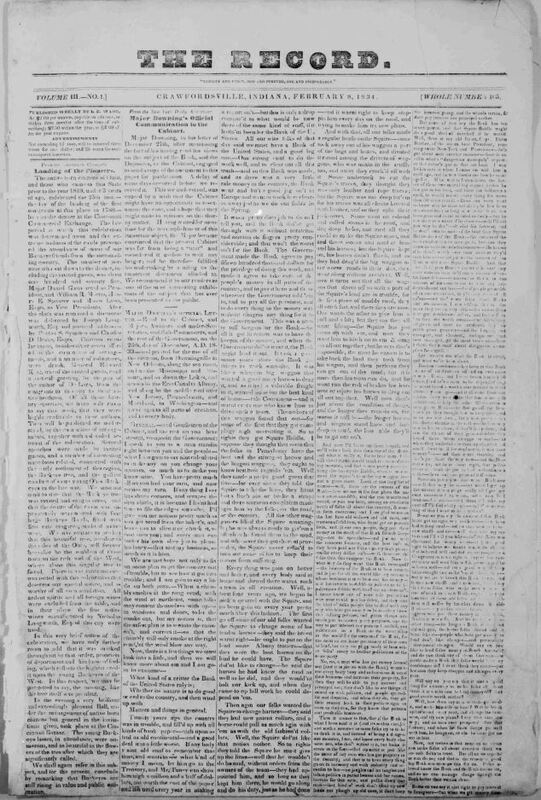 In January 1851, Danaldson issued a short-lived daily edition, the Daily Wabash Express. John B. L. Soule purchased the Express in November 1853 and edited the paper until June 28, 1854. Some sources claim that it was Soule who coined the famous phrase, “Go west young man,” while editing the paper. 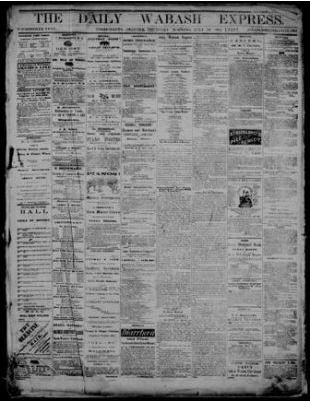 Daily Wabash Express available through Chronicling America at Library of Congress. Robert N. Hudson began operating the Express in September 1855. Hudson also acquired the press of the Know Nothing supporting Terre Haute Daily American around this time. He established a permanent daily, the Daily Express, in addition to continuing the paper’s weekly edition. In 1857, Hudson acquired the Wabash Courier and merged it into the Express’s operations as well. “Devoted to the Whig Policy” continued to appear below the Express’s title well into 1859, even though the Whig Party had collapsed several years before. 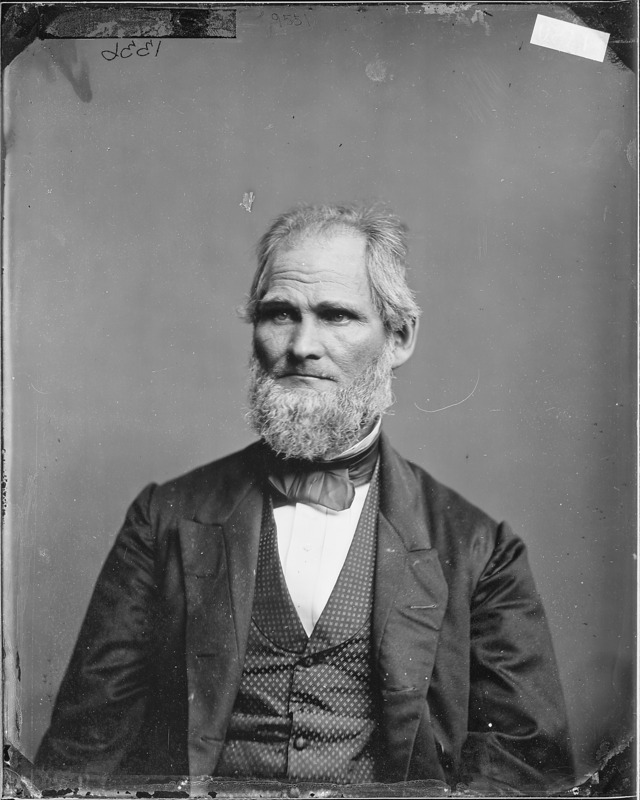 In 1856, the Express endorsed candidates of the People’s Party, a forerunner of the Republican Party in Indiana. Charles Cruft purchased the Wabash Express in 1861 and owned it throughout the Civil War, even while serving as a brigadier general in the Union Army. In 1867, Cruft altered the title to the Terre-Haute Daily Express. Circulations for the weekly and daily editions of the Express neared 1,000 in 1869. Cruft sold the paper in 1872 to the Express Printing Company. From 1875-1879, the publishers operated the paper as a Greenback Party organ and retitled it the Terre Haute Dollar Express. They also started a Sunday edition in 1878. In August 1879, William R. McKeen acquired the paper, changing its name back to the Terre Haute Express. He sold it in May 1882, and in that same year Mary Hannah Krout briefly served as the editor of the Express, likely making her among the first female editors of an Indiana newspaper. In 1883, George M. Allen, the new owner, added a second daily edition published every evening, which was short lived. Allen also instituted other changes: the weekly edition increased to eight pages around 1888, the daily edition expanded to eight pages during the 1890s, and the weekly edition changed to a semi-weekly in 1897. Allen sold the Terre Haute Express in March 1899 to a stock company led by McKeen. Daily circulation reached 3,000 copies in 1900. 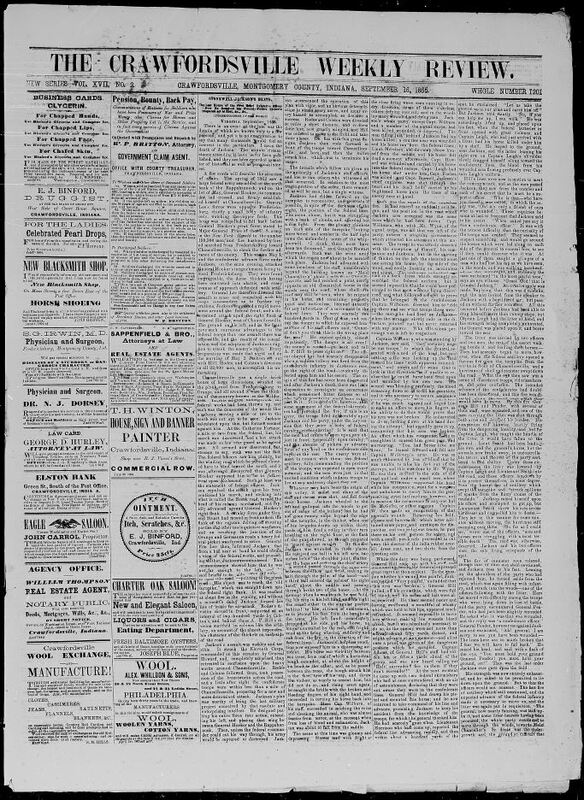 After a nearly 62-year run, the last issue of the Express appeared on April 29, 1903. The non-partisan Terre Haute Morning Star succeeded the Express and until late 1904 carried its name on the masthead as the Terre Haute Morning Star and Express.